China’s Xi Has Stern Warning for Taiwan - Integration Through Media ....! (VOA): Chinese President Xi Jinping has issued a stern warning to Taiwan as he begins his second term in office, telling the self-ruled island it would face the “punishment of history” if it made any attempt toward separatism. 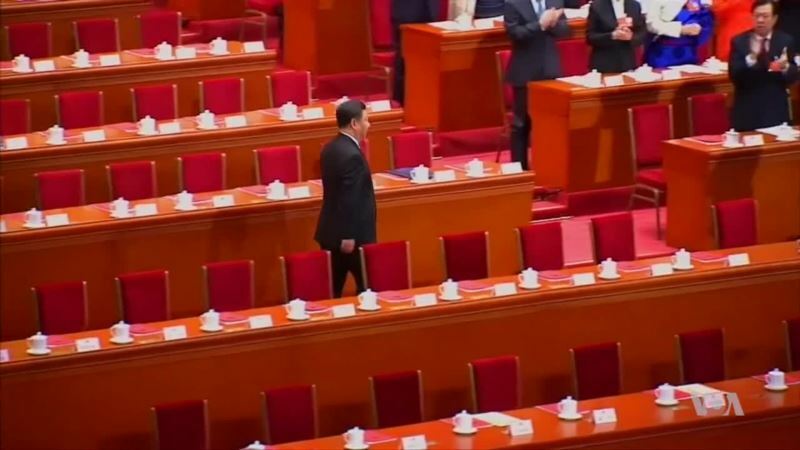 Xi’s comments came Tuesday as China’s largely rubber-stamp National People’s Congress wrapped up a historic legislative session that voted to amend the constitution, scrap presidential term limits and grant Xi a mandate to rule indefinitely. During the meetings, delegates also established a powerful new anti-graft agency to oversee more than 100 million government employees and launched a sweeping re-organization of government ministries. Xi’s warning to Taiwan was his strongest to date and his tough remarks were met with rousing rounds of applause, more than any other part of his speech. China claims the self-ruled island of some 24 million is part of its territory. For Beijing, Taiwan is a sensitive issue and potential military flash point. Xi has been ratcheting up the pressure ever since Taiwan President Tsai Ing-wen was elected in 2016. Tsai is a member of the pro-independence Democratic Progressive Party, but says she wants to maintain the status quo and has advocated a policy of keeping a further distance between the two sides. Taiwan and China split amid a civil war in 1949, and since the 1980s their political systems have been heading in opposite directions. Taiwan democratized in the 1980s and government surveys in recent years show most citizens oppose unification with authoritarian China. Taiwan’s Foreign Ministry spokesman Andrew Lee quickly brushed aside Xi’s remarks and urged other countries to support Taipei’s role as a democracy in the region. Last week, President Donald Trump signed the Taiwan Travel Act, legislation that encourages U.S. officials to travel to the island and meet with their counterparts and vice versa. China has demanded the United States stop official exchanges, warning about the impact it could have on broader relations. Even so, a senior U.S. State Department official is scheduled to visit Taiwan this week. Although it is still unclear how Xi will ultimately respond, analysts say Beijing is likely to continue to ratchet up its political and military pressure on the island. At the same time, China will continue to roll out incentives to woo younger Taiwan citizens and business leaders over to its camp. Earlier this month, Beijing announced 31 measures making it easier for Taiwanese to work, study and invest in China. Now that Xi has the power to stay in office indefinitely, the responsibility of resolving Taiwan and other frictions with neighbors in the region will fall squarely on China’s powerful leader. And many will be looking for him to take decisive action, said Francesco Sisci, a Beijing-based China analyst. And while many have compared Xi’s rapid expansion of power to that of China’s founder Mao Zedong, Sisci argues the context now is different. When Mao was in power, China was protected by the Cold War and the Soviet Union. And at that time, the Chinese economy did not have any impact on international markets, he said.